Hockey players understand the importance of being flexible on the ice. With a sport that has many sudden changes of direction and speed it makes every second count that much more. Having a strong core helps with balance and ease of movement. An exercise that builds strength through the shoulders, hips, core and glutes. What You Need: A flat surface, running shoes, athletic clothing. Body Position: Get on the ground on all fours with your hands underneath your shoulders and toes tucked. Take a small lift off the floor and stabilize. Your hands and toes should still be in contact with the floor but your knees will be lifted. Hold for 10-15 before moving to the next progression of the drill. Lift your knees again, staying stable in your back. Walk both feet outwards, one at a time, so they are in a V shape to your hips. In this high plank, do a push up. While staying in the stabilized position, take one hand off the ground and tap the opposite shoulder before placing it back down. Do this with the other hand. Walk the knees back into the original position and place them back on the ground. The Breakdown: This drill builds on previous exercises from the Hit the Gym series. Athletes should be able to execute the first progression before moving on to the second part of the drill. Core strength is important in increasing balance and flexibility. The core is involved in almost every action on the ice and helps the body move as a unit. You can also see benefits in your posture. OMHA athletes now have access to the ETS Athlete Development App. Pro-grade technologies deliver content and track critical athlete development metrics ensuring athletes and the coaching staff are on track for in-season developmental progress, download the training app. 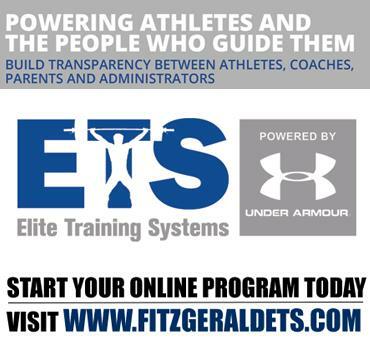 Mark Fitzgerald is the owner and founder of Elite Training Systems as well, as the ETS Athlete Development App. In addition, Fitzgerald is head of Performance Training for the Anaheim Ducks, Lead Training Advisor for Under Armour and a member of the Under Armour Global Team.